We can write a string to text file in java in various ways. Using PrintWriter we can write or append a string to the text file. Using println() method of PrintWriter we can save or write string to text file. After completion of using PrintWriter you need to close it by calling close() method. If you are using java 7 , by using try with resources we can implement it and closing will be taken care automatically. Now we will see an example program on how to write or save a string / string variable to a text file using java 7. 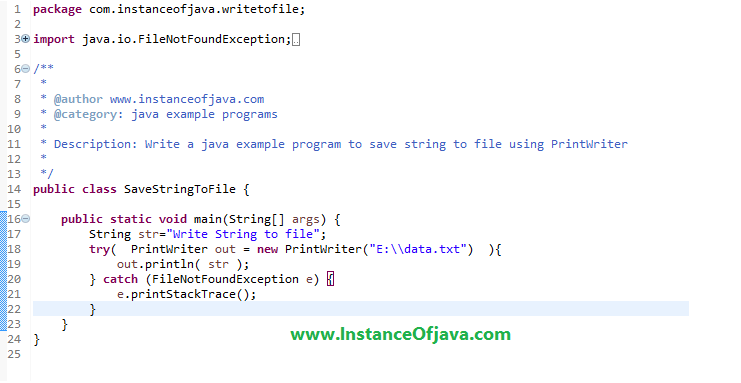 #1: Java Example program to write or save string to file using PrintWriter and java 7 try with resources.